Enterprise Imaging is a way of providing a picture of a multi-organizational enterprise that provides products and/or service outputs. This paper describes the research basis for the image, the process for its construction, and its benefits. For managers the Image can support service enterprise management teams to i) understand the boundaries and interdependencies of their service enterprise; ii) operate as an initiator and support for discussion at the enterprise level; iii) provide a common reference point for multiple perspectives; and iv) form a basis for co-creating holistic enterprise management processes. 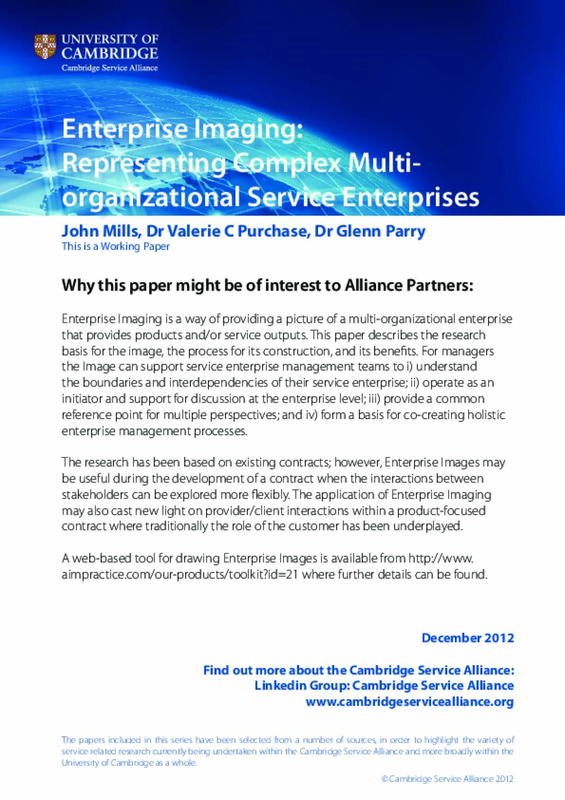 The research has been based on existing contracts; however, Enterprise Images may be useful during the development of a contract when the interactions between stakeholders can be explored more flexibly. The application of Enterprise Imaging may also cast new light on provider/client interactions within a product-focused contract where traditionally the role of the customer has been underplayed.